The Validation Master Plan (VMP); sometimes termed Master Validation Plan (MVP) is used to display or present an overall picture to visiting auditors, of how the company has integrated cGMP into its day to day activities. These auditors have not mandated a strict format for the VMP to follow; however, they have projected an expectation that they expect to be able to review such a document and that such a document must project a picture of how your company has integrated ”current Good Manufacturing Practices” (cGMP); as promulgated in 21 CFR Part 820 & 211, into all aspects of the manufacture of a regulatory controlled product. Even although the VMP is not a mandated document; it inevitably will be the first document regulators will ask to review. This is because they expect this document to clearly and concisely illustrate to them how management has delegated responsibilities, designed product processes, planned resources usage and established a fully trained competent work force. They will look for evidence to convince them that there is sufficient ongoing training to maintain these standards and sufficient auditing to prove it. In authoring the Validation Master Plan extremely important commitments and decisions have to be made. Program conceptions have to be mated to the User Requirements Specifications (URS), Level 1, 2 and or 3, these specifications have to be mated to the VP or VMP. From these plans the User Requirements Specification (URS), the Validation Risk Assessment (VRA), the Design Qualification (DQ), the Installation Qualification (IQ), the Operational Qualification (OQ), and the Performance Qualifications (PQ) have to be authorized, authored, approved for content, and issued for execution. The completed documentation has to be reviewed and accepted as complete by persons authorised to execute this role. 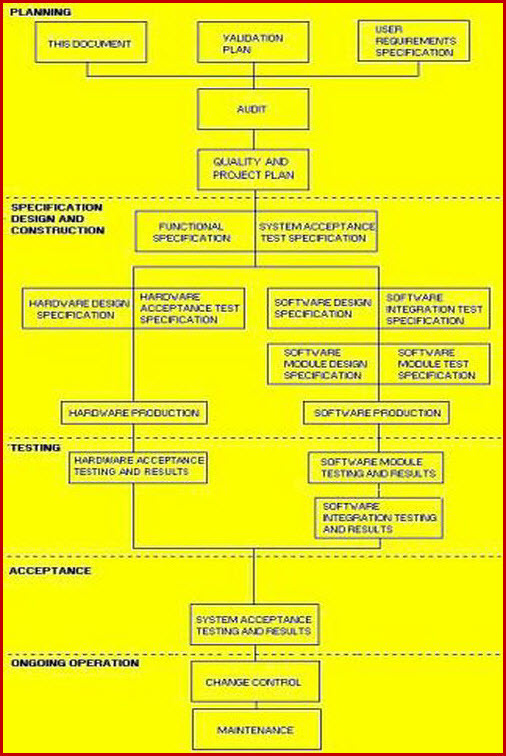 All of these functions must be detailed in the VMP, when the project concept demands that a VMP is required, or the Validation Plan (VP) where it does not. Responsibilities have to be declared, people have to be nominated, and everyone involved is duly served with a copy that carries the full authority of the company. The Validation Master Plan (VMP) must present an overall picture of the company facility, organization and capability. It must give a clear and concise overview of how the company has integrated all applicable current Good Manufacturing Practice (cGMP) requirements into its operations. It must define validation activities and allot responsibilities for authoring, reviewing, approving, and executing validation documentation and tasks. It must comply with all the appropriate requirements documented in 21 Code of Federal Regulation Part 11, 210, 211 and 820 legislation. The Validation Master Plan is a top layer document and should not go into specific detail; but present an overall picture of the company facility, organisation and capability. It must give a clear and concise overview, to a reviewer, of how the company has integrated all the applicable cGMP requirements into every aspect of its operations. It must define validation activities and allot responsibilities for authoring, reviewing, approving, and executing validation documentation and tasks. It must define the range of documentation spreading from the VMP to the VP, URS, DQ, IQ, OQ, P1Q, and P2Q. It must explain and detail the company’s approach to risk based validation and the interaction of the VRA, VA, and 21 CFR Part 11. Facilities are portrayed with the use of layered drawings; where different layers show individual systems and equipment lists give equipment type and identity details. It is normal to include layered drawings to enable a clear and easily observed presentation of the following systems. 1) Facility building overall location and access. 2) Facility production/clerical/storage/controlled areas, rooms or zones. 3) Raw material ingress and finished product egress routes. 4) Personnel ingress and egress routes, along with changing areas. 7) Controlled areas along with air flow directions and pressure regimes. 8) Dressing codes for these controlled areas.